Stephen Taczak grew up in Avella, Washington County. He studied environmental science and business at the University of Notre Dame. He attended the University of Pittsburgh School of Law. 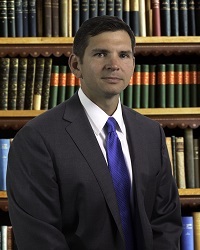 He has been licensed to practice law in Pennsylvania since 2000. He has represented clients in Courts of Common Pleas of Pennsylvania, Superior Court, Commonwealth Court, and the U.S. District Court for the Western District of Pennsylvania. He has handled matters with various government agencies including the Pennsylvania Public Utility Commission, Pennsylvania Environmental Hearing Board, Pennsylvania Human Relations Commission, Department of Revenue, Unemployment Compensation Referees and Board of Review, the United States Social Security Administration, Federal Energy Regulatory Commission, and Equal Employment Opportunity Commission, among others. He has also represented various municipalities along with zoning hearing boards, civil service commissions and recreational and municipal authorities. Attorney Taczak represents individuals and businesses before municipal entities as well. Prior to establishing his own private practice in 2008, Attorney Taczak worked for a prominent Pittsburgh law firm where he represented and counseled major U.S. corporations and insurance companies as well as small businesses and individuals. He has accumulated a broad range of experience in many aspects of law including civil litigation, employment law, real estate, contracts, estate planning, family law, business and corporate law, natural gas leasing, product liability, municipal law, personal injury and construction law. Attorney Taczak has successfully litigated a variety of legal matters. He is intimately familiar with the entire legal process from initial insurance claims through litigation and appeals. He has procured settlements prior to trial, tried cases to verdict, and represented clients in arbitration and mediation obtaining favorable results. Attorney Taczak is also well versed in legal transactions including: contracts, leases, wills, business formation, real estate transactions, employment matters and natural gas leasing. The local boom in natural gas production in the Marcellus Shale and Utica Shale has created the need for experienced legal representation in many areas. Attorney Taczak has represented land owners in lease negotiations, title issues, pipeline right of way agreements, water line agreements, well pad sites, impoundment pond issues, compressor stations, restoration and remediation problems and royalty disputes. He has represented clients in the purchase of gas rights, the severance and retention of gas rights, and royalty divisions. He has helped individuals and families preserve their gas well proceeds with estate planning. In his fifteen years of legal experience, Stephen Taczak has gained considerable skill, knowledge, and understanding. His diverse background provides a solid foundation for counseling clients ranging from individuals to businesses. Attorney Taczak is a member of the Washington and Allegheny County Bar Associations as well as the Pennsylvania Bar Association. He stands on several committees of the Washington County Bar Association including the Court Relations and Pro Bono committees. Taczak Law Office regularly represents clients through the pro bono, modest means and Legal Aid conflict programs to support his belief that all litigants deserve adequate representation. Attorney Taczak coaches youth baseball and basketball. He serves as counsel to several nonprofit and fraternal organizations. If you or someone you know is in need of legal assistance, contact Attorney Taczak for a free consultation.